I hope you all had a wonderful Christmas Eve and Christmas Day with your family and friends. My holiday was wonderful because my son was able to come for the holiday for the first time in four years. (He is usually working). 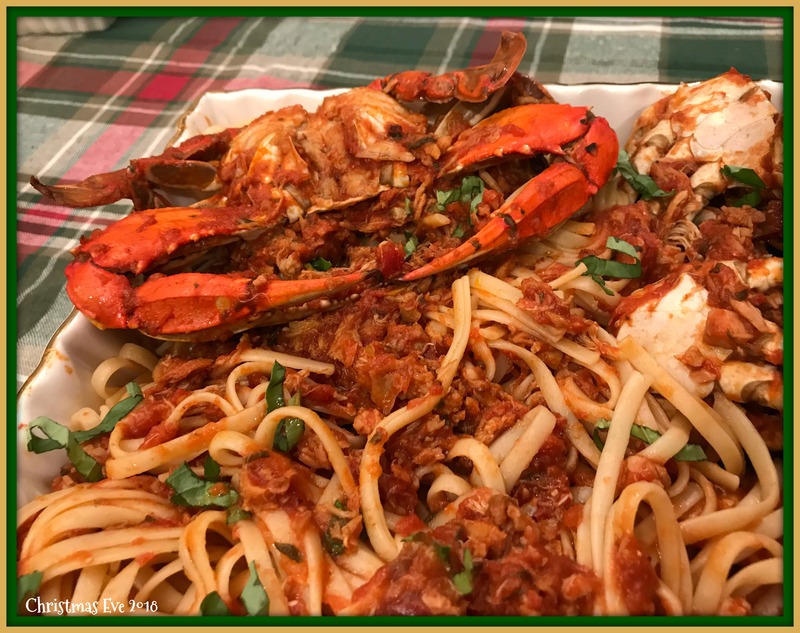 I followed the Italian Christmas Eve tradition and had the “Feast of the Seven Fishes”. This has to be my favorite meal of the year! 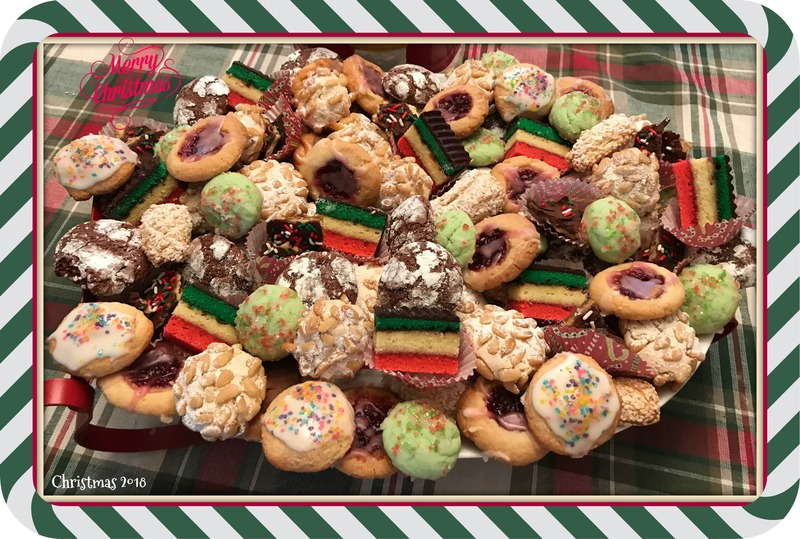 I have been getting a lot of requests for the recipes on my personal Facebook page and decided to post all of the recipes that I use to the blog, so you can all enjoy them. 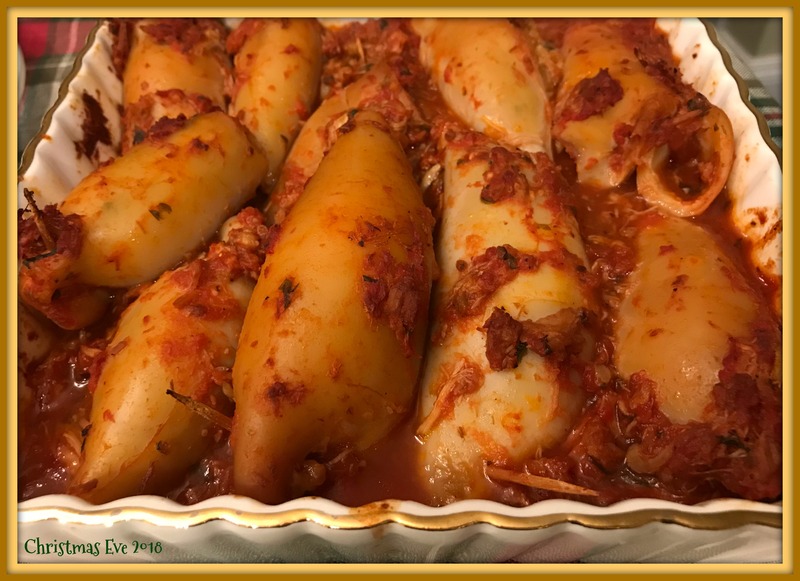 Some recipes are so old that I don’t remember where I got them from, some are a combination of my recipe tweaks over the years and some are fairly new from various websites that I will give credit to when I know the author. I wish you peace, happiness, love, health and many blessings in 2019! 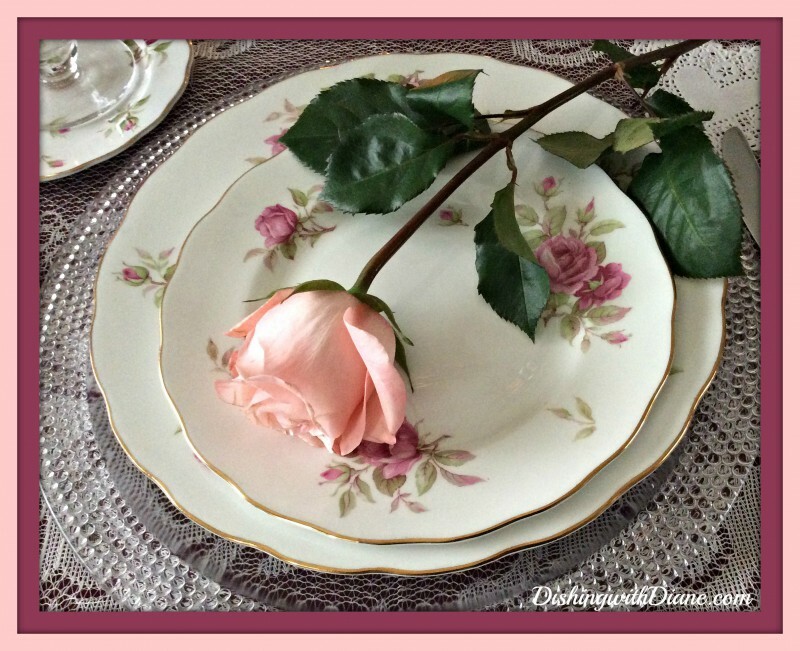 Thank you for visiting my blog and please ask your family and friends to join DishingwithDiane.com and become part of the family! (I do not remember where I got this recipe). *Cooks Note: I use Phillips lump crab meat in the black can. Sold in Costco. Peel shrimp leaving tails in tack, cut slit almost through back of shrimp using paring knife. 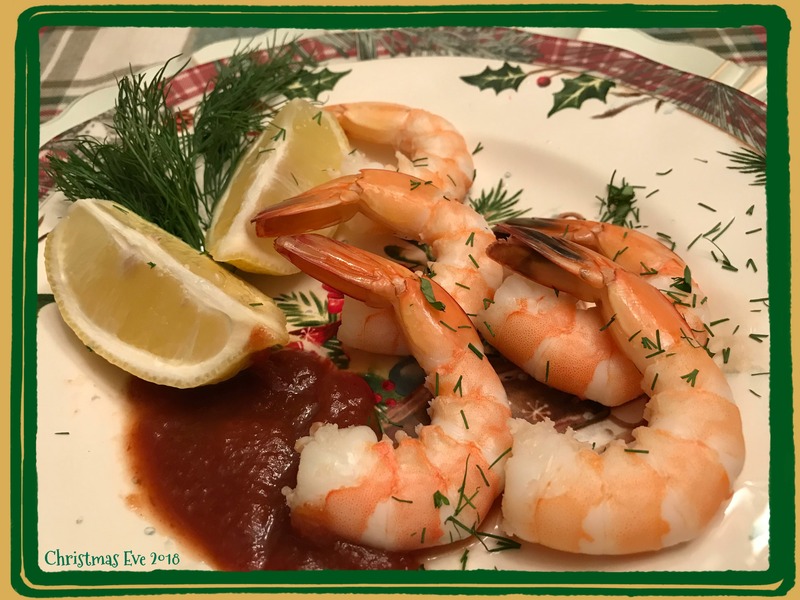 open shrimp to flatten and place in a baking dish that has been sprayed with cooking spray or drizzled with olive oil and set aside. In a skillet, cook onion, pepper, and celery and 1/4 cup of butter, stir often and cook until soft. Combine crab meat, egg, cracker crumbs, mayo, mustard, and Worcestershire sauce, and red pepper in a bowl. Stirring gently add in the cooked veggie mixture and mix well. Top each shrimp with approx. 2 to 3 tbsp. of crab meat filling…and sprinkle with paprika and drizzle remaining 1/4 cup of butter over top of stuffed shrimp. 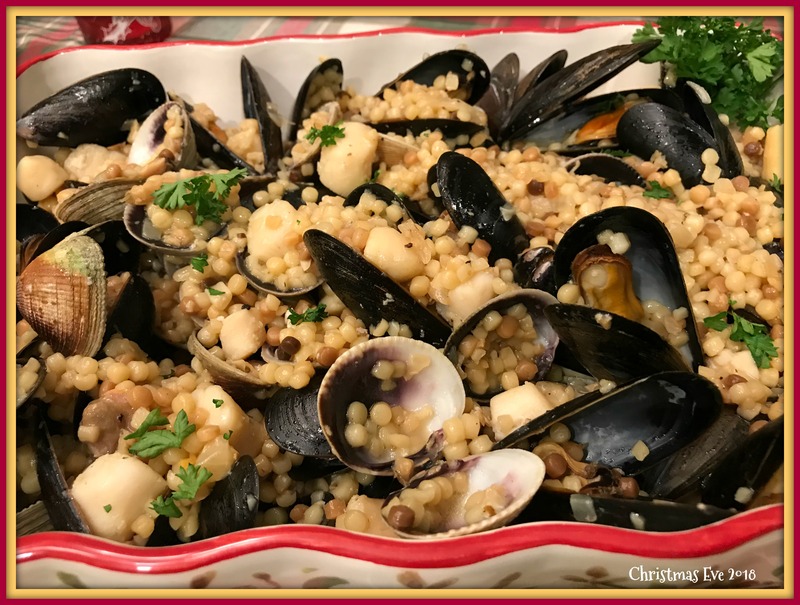 A bit of culinary exotica, fregola is a type of pasta from the Italian island of Sardinia. The more common Israeli couscous may be substituted. Serve this hearty stew with a refreshing butter lettuce and pear salad and plenty of crusty bread for dipping. Crush the saffron in a small bowl and add the wine. Set aside. In a large, heavy pot over high heat, warm 1 Tbs. of the olive oil. When the pan is very hot, add the shrimp and sear for 1 minute per side (do not cook all the way through). Transfer to a bowl. Add the scallops to the pot and sear for 1 minute per side, also without cooking all the way through. Transfer to the bowl with the shrimp. Add the remaining 1 Tbs. olive oil, the onion and garlic to the pot and saute until soft, about 5 minutes. Add the saffron mixture and cook for 2 minutes. Add the broth and bring to a boil. Add the fregola and stir to combine, then reduce the heat to medium-low and cook for 12 minutes. Season with salt and pepper. Add the clams and mussels if using, discarding any that do not close to the touch. Cover the pot tightly and steam for 3 minutes. Remove the lid and quickly add the shrimp and scallops. Cover the pot tightly again and continue to cook just until the clams open and the shrimp and scallops are cooked through, about 3 minutes. Discard any shellfish that failed to open. Ladle the stew into warmed bowls, sprinkle with the parsley and serve immediately. Serves 4. In a small saucepan heat olive oil over medium heat. Sauté shallot and garlic for 4-5 minutes or until soft, stirring occasionally. Add tomatoes, chicken stock, sea salt, red pepper flakes, and sugar. Simmer, uncovered, for 15-17 minutes or until tomatoes break down and release their juices and liquid has almost evaporated. Remove the saucepan from the heat and stir in the butter and fresh herbs. The herb butter should be velvety and thick. Cover and keep warm while the cod is baking. Drizzle the bottom of a casserole dish lightly with olive oil. You want a dish big enough to fit the cod in a single layer with some room around or you will get too much juice during baking. Pat dry the cod really well and place in a single layer. Season with salt and pepper to taste but be generous. Drizzle the top lightly with olive oil and squeeze of fresh lemon. I used about ½ lemon. Cover tightly with aluminum foil and bake for 12-18 minutes or until easily flaked. Baking time will depend on the thickness of the cod. Remove from the oven and evenly spread the tomato butter over the cod. Cover back with aluminum foil and let stand at room temperature for 1-2 minutes before serving. You just want all the flavors to come together. Garnish with fresh chopped herbs, if desired, and serve immediately. **This cod serves really well with cooked rice, quinoa, or crusty bread to soak in all the juices. (This recipe is mine from a combination of different recipes over the years). In a separate bowl, combine the breadcrumbs, garlic, parsley, cheese, 1 cup milk, 1 egg, lemon zest, diced fish, splash of white wine, salt, pepper, onion and butter mixture and olive oil. The mixture should me slightly mealy but hold together if you squeeze it in the palm of your hand. (a little loose- needs more breadcrumbs). Take a small amount of stuffing and fry to test for seasoning before stuffing the tubes. Stuff each calamari tube halfway full, using your fingers to stuff the mixture well into each calamari tube. (When the calamari cook, they blow up, so you can’t fill them too full of stuffing or they will split open). Alternate directions is to bake calamari in tomato sauce in a separate baking pan. 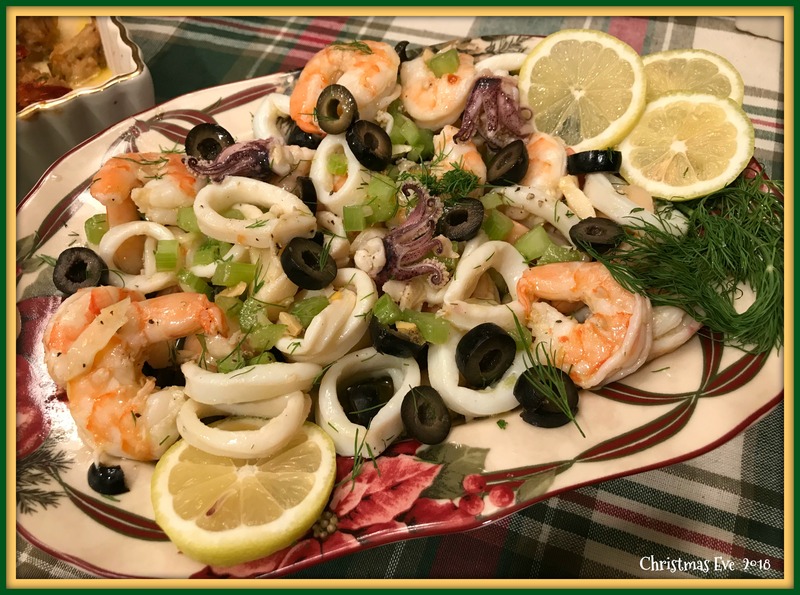 Antipasti di Mare ~ This is a wonderful Christmas Eve appetizer but is tasty year round. 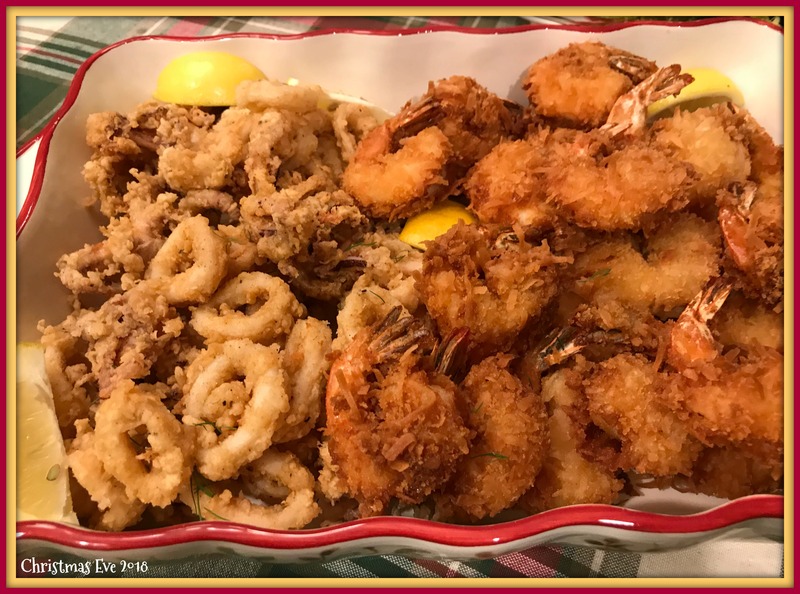 This seafood salad often contains octopus as well as shrimps, scallops, and calamari, but if you prefer, you can certainly leave the octopus out. The octopus requires a much longer cooking time, so if you choose to include it, you will need to add an additional hour or so to your preparation time. In a stockpot, combine 3 quarts of water, the wine, bay leaves, and crushed garlic. Slice the lemons in half and squeeze the juice into the mixture. Drop the lemons into the pot. Bring the mixture first to a boil, and then reduce the heat to medium low. First cook the shrimp, cook 2 minutes and remove from the pot. Cook the calamari 1 ½ minutes and remove from the pot as well. If you are cooking scallops, cook in the same manner for 2 minutes. Mix the seafood together and set aside. Soak calamari in buttermilk for 20-30 minutes. Combine flour with seasonings from paprika – red chili flakes. Dredge calamari in seasoned flour, tossing evenly to coat. Carefully drop a handful of the calamari into the hot oil. Cook until golden brown, about 1-2 minutes. Remove with slotted spoon and transfer to a paper lined baking sheet. Sprinkle parsley on top. Serve with lemon wedges and lemon aioli. Notes: Why buttermilk instead of eggs? The acidity in the buttermilk helps keep the calamari tender and helps create a lighter, crispier batter. So, adding eggs or breadcrumbs is not necessary. (This recipe courtesy of a friend, Marcia Haynes Bohle). 1 lb. Raw Shrimp- peel/de-vein, leave tail on. In a shallow mixing bowl: 1 C flour, 1 tsp baking powder, 1/2 tsp minced garlic, 1 tsp paprika, 1/2 tsp salt, 1 tsp white pepper, 1 tsp Old Bay Seasoning, 1 egg, 1 ½ C S. Pellegrino or other sparkling water. On a foil lined jelly roll pan: 2 C panko bread crumbs, 2 1/2 C shredded coconut, 1 C flour (toss together). Peel & de-vein the shrimp. Leave the tail on. Pat the shrimp dry with paper towels and place in the zip lock bag with flour & cornstarch. Shake to coat. In a shallow bowl, whisk together the flour, baking powder, garlic, spices, egg, sparkling water. This should make a batter, just a little thinner than pancake batter. Holding by the tail, dip each shrimp into the batter an onto the jelly roll pan which has a mixture of bread crumbs, coconut and flour. Coat well with the coconut mixture and chill the breaded shrimp for 30 min. Deep fry for 2-3 min in vegetable oil. Drain on paper towels. Serve with sweet & sour sauce, sweet Thai chili sauce or whichever sauce you like. I’m guesstimating the measurements so feel free to tweak it any way you like. Unless you have worked at a clam bar, shucking clams is not an easy task. Here is an easy way to get the clams opened and save your fingers from shucking. Place in the oven for only 2-3 minutes. This will be enough to loosen the clams up so they will be easy to open. Take the clams out of the oven and with a butter knife or other thin knife without teeth, pry open the clams. I open the clams over a bowl to make sure I catch all the juice that comes out, you will use it in the stuffing. Open up the clam, get rid of the top shell, and loosen the clam in its shell by sliding the knife under the clam. In a medium bowl mix together the bread crumbs, oregano, parsley, garlic, grated cheese, 2 tablespoons of reserved strained clam juice, olive oil, and black pepper. 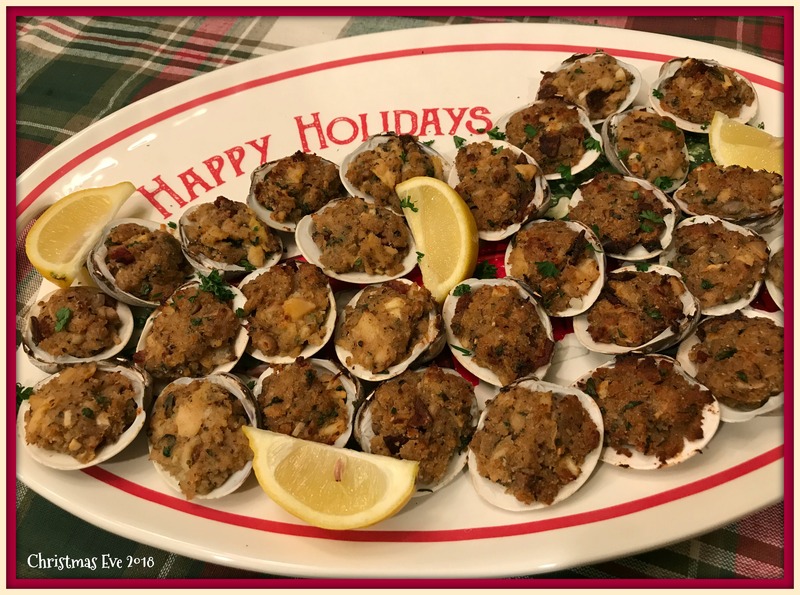 Take the clam and hold it over the bowl with the stuffing. Top the clams with this mixture, but don’t pack down the bread crumbs. Drizzle with some olive oil. Place them under the broiler until the clams are done and the bread crumb is crispy and golden, about 4-5 minutes. Serve with the lemon wedges. Put the water, carrot, celery, onion, garlic, lemon, parsley, thyme, and bay leaves in a pot and bring to a boil over high heat. Lower the heat to a simmer, set a cover on top slightly ajar, and cook for 10 to 30 minutes. Drop the shrimp into the liquid and turn off the heat. Cook the shrimp, stirring occasionally, until they curl and turn pink, about 2 to 2 1/2 minutes for medium shrimp, 3 minutes for large ones. Drain and cool to room temperature. Peel the shrimp and remove the vein along the curve of the shrimp, if desired. Refrigerate if not serving right away. If refrigerated, bring the shrimp to room temperature 20 minutes before serving. To serve put the cocktail sauce in a medium bowl and surround with the shrimp, or loop the shrimp over the edge of an individual cocktail glass and top with the sauce. Garnish with the lemon and serve. Combine the ketchup, lemon zest and juice, horseradish, and Worcestershire sauce in a small bowl. Add hot sauce, if desired. Mix well, then refrigerate until ready to serve. (This recipe is mine combined from various recipes over the years). 6 cleaned blue claw crabs (your fish monger will clean them and just rinse them when you get home). Add the shallots and a pinch of salt and sauté for 1-2 minutes until translucent. (this does not make the sauce taste fishy. I add it in my white clam sauce as well). Now add the crabs and sauté for about 5-7 minutes until the claws become red. Mix well with the parsley mixture to get the oil and garlic in the nooks and crannies of the crab. In the meantime, put two cans of san Marzano whole peeled tomatoes in the food processor and blend. Add the tomatoes, wine and clam juice to the crabs. Sauté on medium for approx. 20 minutes with the lid a jar. After 20 minutes if the sauce seems too watery add 1 tbsp of tomato paste and continue to simmer for 5 minutes. Simmer on low until you prepare your pasta (usually linguine for this dish al dente- 7 minutes.-– (I cook the pasta two minutes shy of being done). Add your pasta to a large pot or saute pan and add the crab sauce, cook for two minutes so the sauce can be absorbed by the pasta. 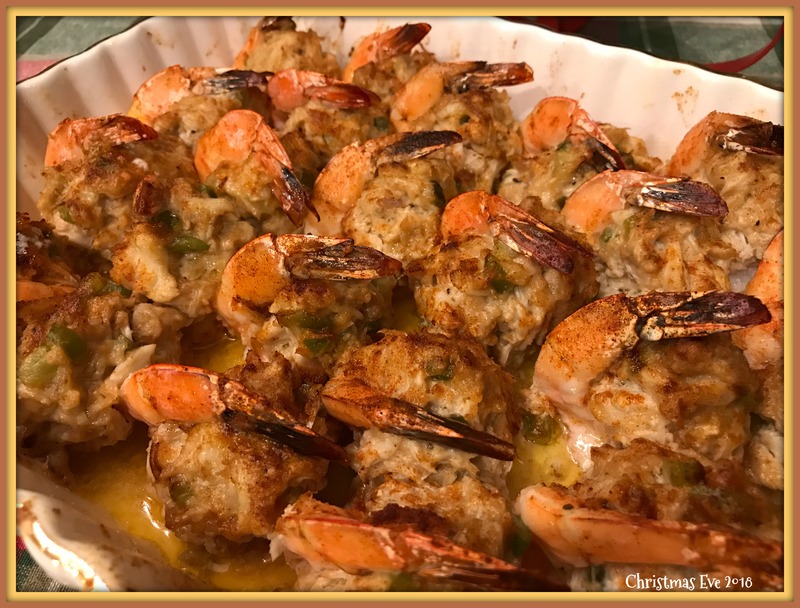 This entry was posted in Christmas..., Seafood on December 28, 2018 by aries041158. Such a beautiful blog – Merry Christmas and Happy Healthy New Year! Thank you for the sweet compliment Patti. May the New Year bring you many blessings. Hi Diane, We’ve written one another several times before. I always love the way your dishes look, so I’m glad you have this blog. Following it now! Can’t wait to try something of yours soon.Happy new year. Hi Irene and Happy New Year. Glad to have you join the DishingwithDiane family, thank you for joining. I hope you find just what you are looking for. 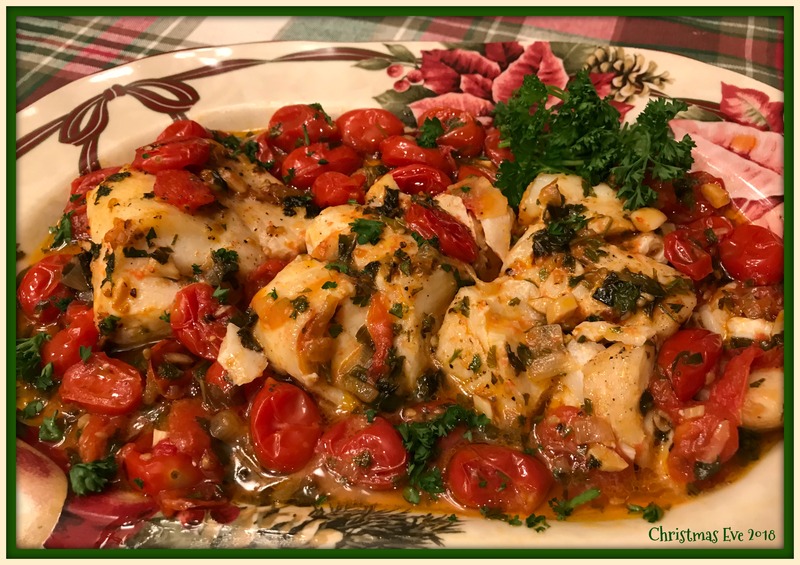 hi diane love your site already and i noticed your stuffed calamari reciepe is the exact same as mine but i also chop scallops and add. i have other ways been doing this for 55 yrs at least learned it off of my mother who was from rome italy. i am like her and being creative ! your recipes are fantastic we are going to get along real well ! Hi Andrew, So happy that you enjoy the blog and welcome to the family. Enjoy the mussels recipe.